Mariah Carey is one the most successful female entertainers and artists in music history. She surely has the potential and talents to be the star that she is. Nevertheless, it isn't her potential and talent that is first and foremost the reason for her achievement. It is largely her faith in herself, in a Higher Power, and in people that pushed her to the achievement she has achieved. "If you believe in yourself enough. And know what you want. You're gonna make it happen Make it happen." Mariah Carey is an American singer songwriter and an actress. 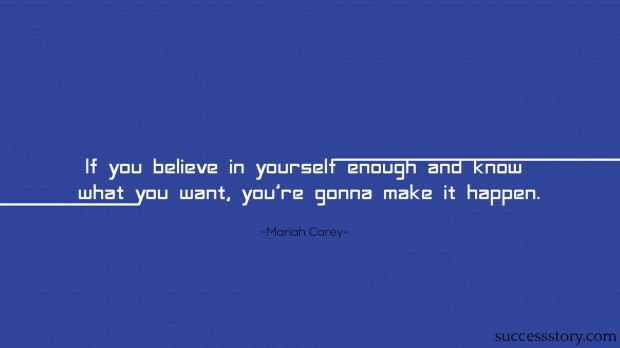 Not to give up in the face of difficulties as life is full of them is the basis of quotes from Mariah. She opines that one has to look into oneself and find his / her own inner strength and be proud of who you are and believe in yourself and affirm that you are going to remain what you are. Never to give up whatever situation or phase you may be passing through in your life. Self confidence and self morale boost is must to attain success in whatever you do. Mariah had her own scary feelings and she always felt like the rug could be pulled out from under her at anytime. And coming from a racially mixed background, she always felt like she didn’t really fit in anywhere. However she basically started singing when she started talking , pretty early in her life . Music has just been her saving grace in her whole life. She had her share of problems but she fought on cause she felt there was a light in her that shone brightly. They can try, but they can’t take that away from her, her confidence and belief in herself. The inner strength that she developed reflects in her very popular quotes , she also says that if critics have problems with her personal life, it’s their problem. Anybody with half a brain would realize that it’s the charts that count. So work hard and work towards your goal and become successful and bold. She always believed that faith is the first stage of change because no one knows the future until it really arrives. So, you require having faith before you make the first step. Ms. Carey has established faith in herself and in a higher ruling power in the material world. It is truly remarkable the amount of faith that she has established throughout her career and life. If you have something to attain in life and to proffer the world to make the world the best place you owe it to yourself and to others to follow your passions and dreams. Mariah Carey always smiles with a big smile from the heart. Each smile that graces that attractive face of her's is a smile of success that says the world is a magnificent place when you don't give up in there to the end. That is a lesson that we all can learn from her.